Fifth wedding anniversary and Mr Plummy Mummy organises for his mother to look after sprog so we can swan off to Glasgow on Saturday for a spot of shopping, lunch at The Dhabba an award-winning restaurant dontchaknow, followed by a bit of culture via the Italian Art exhibition at the Kelvingrove Museum. I was a tad amazed as my other half is not the first to jump at the chance to shop and even less keen on art. I looked forward to the day and even promised we would first go to Forbidden Planet to stock up on comics (normally this is the last stop in a shopping day out when no one is in the mood). But, argh ghastly, lucky I got tonsillitis the week before and things looked dodgy. But I’m a stoic old gal who wants her curry and wants it now so sickness aside, even the 7.30am wake up with no anniversary cuddle didn’t put me off. We got to Glasgow so early that hardly any shops were open but eventually made our way to the comic store where hubby went a bit mad (so much so that we spent precious shopping time trying to buy a rucksack to carry his haul of comic goods). Then, yippee, it was time for lunch. 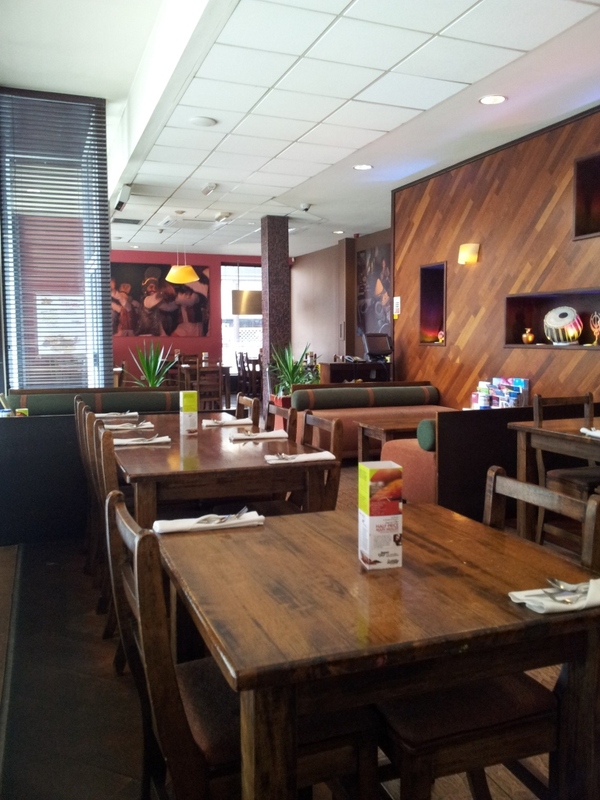 The Dhabba is in Glasgow’s Merchant City, close to Glasgow Central station. It was Saturday lunch, and though it was in the business end of Glasgow, I had expected at least a few other diners. The place was deserted. It was hilarious that we had a table booked but you just never know. Eating in an empty restaurant is awkward as you are missing the atmosphere that makes eating out fun – the hustle bustle of waiters, the eavesdropping of conversations, the fun of watching people enjoying themselves. You also don’t really get an idea of what portion sizes are like or have a nosey glance at what other diners are eating. I almost walked out. But I was intrigued. Where’s the flock wallpaper gone? Do you remember in the ’70s and ’80s when curry houses had flock paper and Formica tables? Those days are long gone and here we found neutrally painted walls with some large North Indian images, sculptures and musical instruments, a discrete bar, laminated floors and lighting that you didn’t hit your head on as you sat down…yes, like our homes, restaurants have had that Ikea-type touch. It’s all so modern now. Another trend is the little story in the menu which tells you about the restaurant name (Dhabbas are roadside restaurants in India), the type of food (Northern, Punjabi, ie not your bog standard curry house – Bengali) etc. I skipped over that as I was really only interested in eating. When nervous I make jokes. In this case it was with the waiter about how empty it was and that each time a waiter came to our table, it was a different guy. We did eventually get our original server back – a nice Punjabi boy (I’m just guessing here as he had a turban on) who had just finished a Business degree. He explained that the owners had another restaurant in the area specialising in South Indian food (Dakhin). We were told Punjabi people prefer to eat Punjabi food. 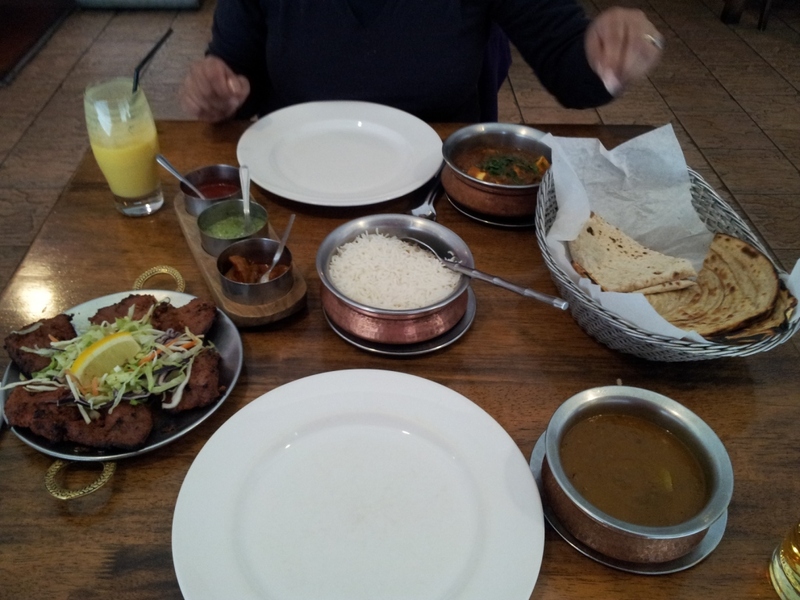 Well this little Gujarati gal and her Scottish man also like Punjabi food. I was pleased to see a separate section for vegetarian meals plus plenty of options in other parts of the menu (eg starters and tandoor sections). Most of them were paneer which didn’t bother me as I love the stuff. Helpfully, the menu had icons for hot and very hot meals. As it was lunch we decided to forgo the starters. I had a hot Kadai Paneer (£9.95) with roti and rice. Hubby had a main from the tandoor menu, Boti Kebab Badami (£11.45), which is lamb fillet cubed and marinated in an almond paste with a naan. He opted to have a kadai sauce with his meal. The waiter was helpful in telling us that one rice would be more than enough with the naan and rotis. While we waited we had drinks – a delicious Mango Lassi for me, Kingfisher for hubby, and we ate some papads with a selection of chutneys. Surprisingly this was the only slight negative in the experience as there was a green dip that was very bitter tasting although the papads were very crisp and fresh and the two remaining options (a mixed pickle, and a tomato chutney) were tasty. Hubby’s kadai sauce was a slightly different colour to the one in my meal but I soon forgot all about it as we tucked in. The spicing was just right for lunch – hot enough to enjoy but not to sit heavy in the tummy. The paneer was fresh and firm. I would have liked a few more peppers in the dish but in the end I gobbled up what I was given with glee. 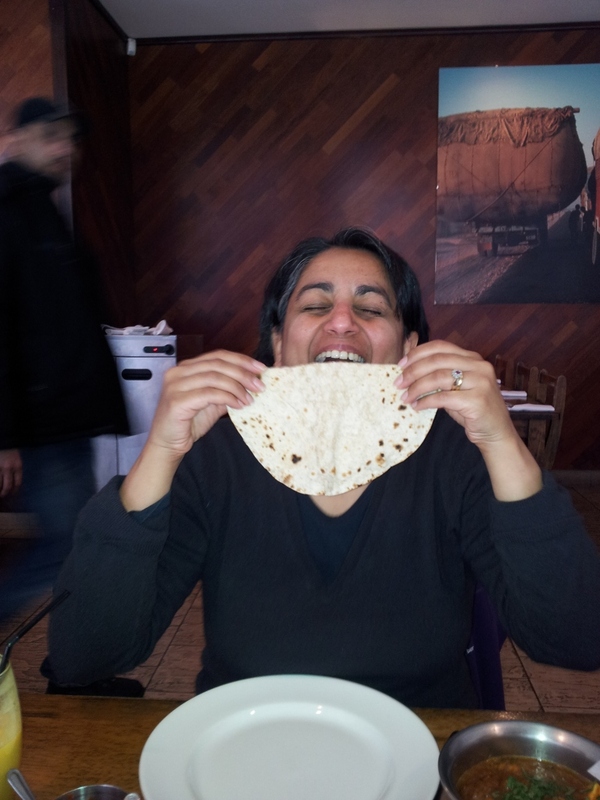 The rotis were quite thick but tasty. Hubby didn’t managed to finish his very large naan but happily ate up all his lamb (without making much of a dent in the accompanying salad stuff!) and we finished the rice between us. We decided not to have a dessert as we were full so just got the bill. 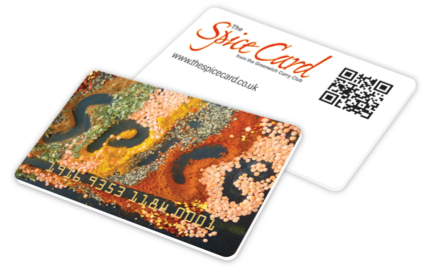 Although it’s a modern place and the prices are high compared to your local takeaway they do deals. We were given a Weekend Shopper/pre-theatre discount of half-price main meals. A bit of a bonus really. When we asked about the empty restaurant the waiter told us that the previous weekend the restaurant had covered 150 tables. I think the weather and the Celtic v Hearts footy game may have kept people away the day we visited. It is just the way it goes. I’m going to convince hubby we should visit again for an evening meal and I’ve got a feeling he’ll jump at the chance. PS. Alas the tonsillitis got the better of me and after the meal, we gave the art gallery a miss and we went home. P.P.S. I mentioned to the waiter that my most fave restaurant ever is the Punjab in Neal Street, London. He asked how they were different. I can’t put my finger on it but it think it’s the old wallpaper, the old photos, the laid-back Punjabi owners, the carpet on the floor but most importantly the gorgeous food. It’s a close call so for now, lets say The Dhabba is now my fave Punjabi restaurant North of the Border. Ah yes Wallpaper, curry houses. I guess times have moved on,shame.